Ed Choice’s Drew Catt created this open enrollment map of Indiana. For those squinting at their iPhones, bright yellow signifies a district taking in 0-25 open enrollment students, while dark green denotes a district bringing in 501 to 1,680 open enrollment students. The Fordham map denotes participation/non-participation by districts in open enrollment. Suburban non-participation jumps off the page of the Fordham map, so let’s contrast Indianapolis with Columbus. The Indiana map has a lot of green around Indianapolis, signifying open-enrollment participation by the suburbs. Now let’s compare Indiana to the open enrollment data available from Arizona. Much larger numbers in these Arizona districts, but also a broader definition of open-enrollment being utilized for the Arizona data that includes students transferring within district boundaries. Nevertheless, we know from a separate source that Scottsdale Unified has 4,000 students from outside of district boundaries, which is more than twice the number of any of the Indiana districts in the Ed Choice map. So here is my provisional take, subject to your challenge in the comments: Indiana’s combined choice programs have coaxed the state out of the Ohio-like geographic segregation. Private choice program design may have contributed to this- Ohio’s voucher programs focus almost exclusively on urban students, while Indiana’s are more inclusive. Indiana has had the nation’s fastest growing voucher program in recent years. Although means-tested, Indiana’s private choice programs create empty seats in suburban districts more than is the case in the Ohio programs, which reach only suburban special education students. The open enrollment boulder has been rolling down hill for a longer period of time in Arizona. Open-enrollment students outnumber charter students 2-1, and charter students outnumber private choice participants by 3-1. In other words, in Arizona school choice is being done primarily by school districts themselves. This of course did not happen exclusively through a process of spontaneous enlightenment whereby Arizona school districts threw down the drawbridge over the moat to welcome in thousands of out of district transfers out of the goodness of their hearts. Rather it was the product of incentives- hundreds of charter schools opening in suburbs and towns and a couple of decades of geographically inclusive private choice programs. Charters and private choice do not deserve all the credit, as some suburban districts relatively unaffected nevertheless chose to participate in open enrollment. Chandler Unified for instance watched their enrollment grow by a third despite a large increase in charter schools and has been rocking academic growth to boot. I’m told that there is not a non-district charter in the Vail Unified district south of Tucson, but there are a many students from Tucson Unified. I doubt they are sweating choice much, but they have nevertheless chosen to participate, and Arizona’s students are the richer for it. Nevertheless, it seems self-evident that a main reason that Scottsdale Unified took in 4,000 students is due to the 9,000 students that live in the district boundaries and do not attend school in the district. The defection of early open-enrollment adopters increases the pressure on other districts to participate, creating a virtuous cycle. I’m thrilled to see evidence of this in Indiana. The School Choice 1.0 failed urban students insomuch as it failed to unlock the suburbs. It’s time for the movement to embrace an inclusive “Social Justice Plus” strategy that aims to give urban students access to private, charter and suburban schools. The Obama administration has tied its education policy declarations to a mantra of being non-political and non-partisan, choosing instead a policy focus only on “what works”. This principle has been repeated incessantly. However, the D.C. Opportunity Scholarship Program (OSP) is a successful program. The Department of Education’s official evaluation using rigorous “gold standard” experimental evaluations determined that the OSP has produced significant achievement gains. The OSP is serving those families and children most in need in one of the worst school districts in America. Average income of participating families is less than $24,000 annually and more than 85% of participating students would otherwise be attending a failing school under NCLB guidelines. D.C. residents polled by three unaffiliated firms in ’07, ’08, and ’09 showed between 66 and 75% support for the OSP. The D.C. superintendent and the Mayor support the program. The decision to kill the program is contradictory to anything the administration claims to be its guiding principle. The cost of the successful OSP is financially very small by comparison to any K-12 standard while at the same time there has been a gigantic increase in education spending nationally— to support status quo systems which are widely considered failures. Strong evidence of success, academically and financially, clearly makes the decision to kill OSP unprincipled. The reason for killing OSP is the intense opposition of national teachers unions to a voucher program of any kind, anywhere, anytime—even if it is academically successful, financially responsible and so popular with the community served that there are long waiting lists. If this successful program had been able to be replicated—a fear obviously driving the decision to kill OSP—the number of students from the most disadvantaged families whose life prospects could have been enhanced could be quite large. This consideration makes the decision to kill OSP even more egregious, although even helping a small set of students is the principled thing to do. The effect of the decision to kill OSP on the lives of the students who could have benefited from its continuation is extremely negative. There is no way to avoid this conclusion. If a social scientist extrapolated the trends of two sets of students, one in OSP and one in a typical DC school, the loss of life opportunities would be stark for the typical set of students. This when joblessness for 16-to-24-year-old black men has reached Great Depression proportions — 34.5 % last October and estimated to having exceeded 50% by last year end. So, for me personally, I can’t justify supporting such an administration or its policy makers even if some of their other policy choices are more productive, nor can I see believing anything they say or trusting anything they do. It can no longer be acceptable to be principled just some of the time. No Mas. I listened to the Federalist podcast this morning on my bike ride in which Megan McArdle debates Joy Pullman on school vouchers. In the discussion McArdle posits that parental choice programs allow parents to sort their kids for the purposes of being around other kids who are likely to want to go to college etc. She acknowledged that her instinct on this is informed by observation in the District of Columbia where she resides and that this has always been the case, it simply used to involve moving the suburbs. McArdle forsees a low-ceiling for choice as McArdle asserts that there are only so many good peer groups to go around, and large influxes of poor kids will lead to upper-middle class parents seeking to segregate their children elsewhere. Thus McArdle puts forward an air of jaded realism for choice as opposed to her optimistic days when she thought of parental choice as a cure for poverty. Worse still, her thesis would imply costs to choice for disadvantaged student groups. Fortunatley, McArdle’s realism is not terribly realistic. Policy enthusiasts of all sorts and persuasions create problems for themselves when they sell their reform as a wonder drug that will cure the world’s pain and will do it today. People who buy in during the naive enthusiasm stage will invariably feel disappointed. This for instance is starting to happen with technology based personalized learning now. The course of innovation does not run smoothly or in a predictable fashion. Technology enhanced learning may have a very bright future, but faces a messy process of sorting through things whether it ultimately proves out or not. The dot.com bubble provides a useful example. People of a certain age will recall the naive enthusiasm stage when any idiot who could mumble Silicon Valley lingo was able to get millions in venture capital funding for projects like Dogfood.com or whatever. When a great many of these dubious ventures went bust in the early aughts a fierce backlash mocked the broad notion that the internet was going to profoundly change business. Give it some time however and no one is mocking now. The internet did profoundly change business and life and continues to do so- it just didn’t do it much by 2003, and not in the way we expected. McArdle’s thesis combines elements of the disappointed naive early enthusiasm with a theory that those not exercising choice may be harmed by it. A large empirical literature on competitive effects however finds positive benefits from choice from students choosing to remain in district schools. The kids “left behind” in other words benefit academically from the fact that they have the possibility of leaving. My home state of Arizona is a hot-bed for parental choice. We not only have the highest state percentage of students attending charter schools and private choice programs, recently data has come available showing that inter-and-intra district choice dwarfs both charter and private choice in the state. Arizona, a relatively low spending state (relative to other states not to its own past) that is in the midst of a border-state transition in student demographics (K-12 students ceased being majority Anglo years ago), is an odd state to be leading the nation in academic gains. Oh, well, we went and did it anyway. This of course does not prove that school choice lead to the larger than average gains, but good luck explaining how this happened if school choice were harmful to disadvantaged students. If these charts were reversed and we saw disadvantaged children showing less progress than the national average, but stupendous gains for already advantaged kids, that would be consistent with McArdle’s thesis. If I wanted to beat the horse into horse-burger I could put up similar charts by ethnicity and disability status. You have a very, very hard time finding supportive evidence of choice harming the disadvantaged in the academic trends of the nation’s most choice happy state, or in the broad empirical literature. Improvement of schooling outcomes maybe a necessary but hardly a sufficient step in inter-generational poverty. Choice programs have triggered a process of opening up the suburbs to open enrollment in Arizona, and they seem to be doing something similar in Indiana. The choice movement made a grave error in fixating on a particular type of school in inner cities, and then became obsessed with “accountability” when the urban-only strategy floundered. I’m confident that the evidence will prove out that broad, inclusive programs work out better for students by hugely broadening available options relative to the necessarily limited efforts to build new charters. If you want to help inner city kids, yes you give them access to private schools and charter schools. If you really want to help them you give them access to all of that and the leafy suburbs (see above charts). You can’t force the burbs to take out of district kids, but you can create the right incentives by subjecting their (all too often complacent and underperforming) schools competition as well. You create enough competition to allow parents to close schools they don’t like. Expect backlash from reactionaries along the way. It’s not quick, it’s not easy, it lacks magical powers. It can however deliver real benefits to students and taxpayers. Megan McArdle wrote a lament for school vouchers at Bloomberg. I’ll briefly lay out why I think a stronger case for optimism is warranted before trying to beat back insomnia with a youtube documentary of ancient Egyptian engineering (I wish I was making that up). The first problem involves an over-reliance on studies of short-term test score trends. Our ability to study student test scores within the confines of a random assignment study usually lasts about three years. During the early part of those three years students are dealing with negative transfer effects in the early going. So if we take the available evidence from Milwaukee, within the random assignment window the evidence looks to me like this: the normal trajectory for a low-income urban child is to fall further behind over time. The control group of voucher users does not follow suit. By the time the random assignment study falls apart some of the differences in test scores are statistically significant and in favor of the voucher students. Is this a failure? It depends largely upon your expectations. If you had expected Milwaukee vouchers to heal the world’s pain, this is indeed disappointing. If you however gather some longer term evidence, find that the voucher kids have meaningful long-term attainment benefits and realized these benefits at a much smaller cost per pupil than the public system, you take a different view. I see Milwaukee vouchers as a success in an evolutionary process and want to find ways to make it more successful. Milwaukee type programs suffer from design limitations and have hit a ceiling politically. They were basically designed to give families the option to move children into a preexisting set of private schools with empty seats. That’s a wonderful thing for many families, until you run out of empty seats. This doesn’t make these programs bad, just limited. Compared to the district that spends twice as much, has lower test scores and lower graduation rates, it is a bit of a triumph at least until your supply of empty seats runs out. If we want more than that (and we should) we need more robust programs. By “more robust” I mean programs with more equitable funding levels, enough to spur the creation of new schools. Programs that allow parents options outside of just private school tuition into a wider array of colleges, tutors, and service providers. Programs open to all children and communities that address with equity issues through funding weights rather than self-defeating exclusion. The ESA concept remains a work in progress with young programs operating in AZ, FL, MS, NC and TN. For a number of reasons, I believe that this model has a much higher academic and political ceiling than version 1.0, but caution is warranted. Part of the reason we see articles like McArdle’s is because we promised that the tears of vouchers would cure cancer like tomorrow. School vouchers were a vitally necessary step in a process of unpredictable pacing, but they were more like your father’s Oldsmobile vis-a-vis your great grandfather’s Model T. We all want our flying car and we want it now and I can only tell you we are working on it, and the status-quo is both undesirable and unsustainable. The tears of ESAs won’t cure cancer tomorrow either, but the best is yet to come in the evolution of putting families in charge of the education of their children. David Leonhardt delivers what I suspect will soon become standard talking points on the left: vouchers have failed but the more heavily regulated charters have succeeded with the latest DC Opportunity Scholarship Program evaluation serving as the launch point. Mind you it takes a severe case of recency bias in order to reach this conclusion. Previous evaluations of DCOSP found a very large high-school graduation rate advantage at a fraction of the overall cost per pupil, but never mind that the more recent evaluation found lower math scores after year one-FAIL! Get more charter schools in here stat! The thinking in the piece is both flawed and shallow, but private schooling in the District of Columbia is in fact in a death spiral, and one of our tribe’s own making. 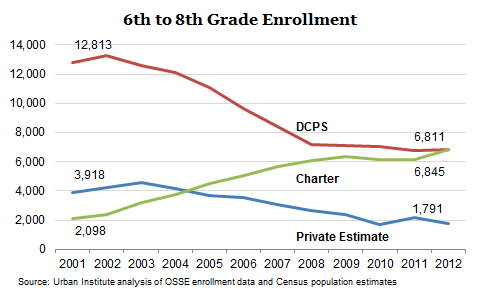 The Urban Institute has been tracking private school enrollment in DC, and it has been in steep decline despite the existence of OSP. 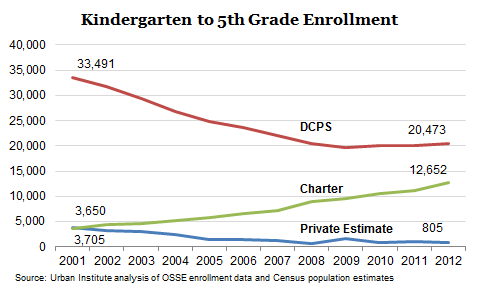 OSP in short is far too weak of a policy to compete against DC’s charter school law. The Opportunity Scholarship Program lacks crucial features that would give it a chance to compete. First and foremost DC charter schools have higher and far more reliable per pupil funding. 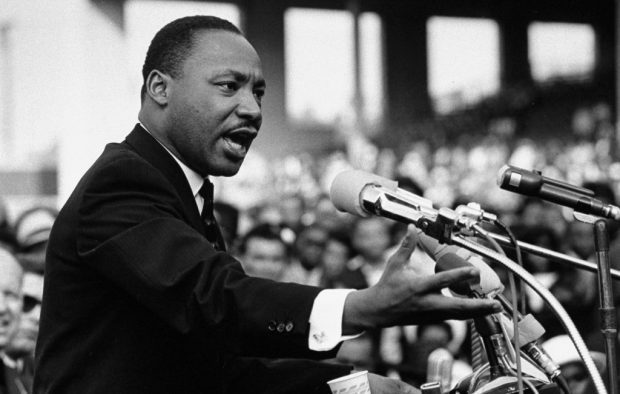 The reliable part in the long run outranks the amounts in importance. DC OSP budgets have been a political football over the years. You would not only be nuts to start a private school in preference to a charter in DC, the finances have given hard nudges for many private schools to convert into charters-which has in fact happened. Second charter and district school funding in DC is universal. Donald Trump can send his son to a district or charter school in DC and no one would blink. For some reason however DC OSP is limited to only a small number of low-income families on the basis of a continually imperiled appropriation. Stare long and hard at the above chart if you’d like to see how this strategy works out politically over time, but self-marginalization looks pretty accurate term to these eyes. If we had this wiser Congress, DC parents would be in charge of what sort of schools survived and thrived in the District. If parents chose to shutter private schools under such a set of circumstances, you would hear no complaint from me. With our current set of policies, it should be obvious that a charter sector with more secure, more generous and universal funding has been and will continue to crush a sector with politically insecure, less generous and very limited funding. Meanwhile back at DCPS, the district continues to produce Detroit-like results for low-income kids despite enormous resources. Now some of our Congressional Olympians would like to bring their wise and benevolent private choice policy making to the rest of the country. Pay no attention to the complete hash Congress has made of DC OSP for the last decade-this time it is going to work out swell. Congress has unwittingly presided over the extinction of the private school sector in their own city and either did not care or did not notice. Call me a cynic, but skepticism seems abundantly warranted regarding wide-ranging federal adventures into private choice policy. Congressional supporters of parental choice who want to !do something! should start by fixing OSP before it is too late. Show some success in crawling before you attempt to run a marathon, please. You are currently browsing the archives for the vouchers category.